Traditional in vivo animal methods for assessing safety and toxicity continue to be replaced by alternative methods: in vitro and in silico. In addition, these alternatives are evolving into key technologies, practices, and resources for future medical applications in efficacy and precision. 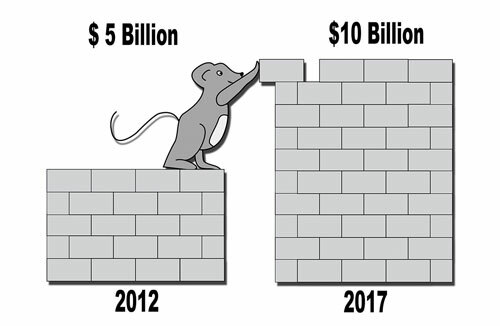 Having developed over the past 20 years into a global market recently estimated at $5 billion, in vitro and in silico products and services are now about the same size as the in vivo services (contract research organization) industry. While growth has leveled off and there have been significant reductions in some countries, the number of animals used in research globally still totals almost 100 million a year. And new markets such as China could drive significant increases unless alternative methods are adopted. Although the majority are mice, more can be done to encourage alternatives. Increased adoption of alternative methods by pharma seems inevitable as the industry focuses on increasing productivity and decreasing adverse reactions. But how fast is this uptake likely to go? The cosmetics industry has been largely responsible for the initial technical and commercial successes, in the form of skin tissue substitutes. Encouraged by regulatory initiatives dating back 15–20 years and public opinion pressures that have recently become more focused, these new developments ultimately enabled in 2013 the final passage in the European Union of an extremely stringent sales ban on animal testing. This policy move may not seem especially relevant to pharma. Nonetheless, it reflects the alignment of technical (stem cells, imaging) as well as social developments (environmental concerns, consumer influence) that ultimately affect the cosmetics industry and pharma alike. Even allowing for conservative adoption by pharma, double-digit growth is expected for at least the next five years. Recent innovations in the cells themselves (from immortalized to primary to stem cells), in the equipment used for detection and analysis, and in the nascent $1 billion marketplace for specialized assay kits and validated protocols, all support broader use of in vitro methods. Data handling and other standards are still stretching to span from basic workflow across the vast landscape of transcriptomics, proteomics, metabolomics, and cellomics. Some platforms, however, have emerged as clear favorites, and in 2013 in silico disease models even garnered agency letters of support. With a 15% compound annual growth rate, the market for in vitro and in silico methods of assessing safety and toxicology is projected to double by 2017. Thus far in pharma, the cardiovascular field has provided the easiest path to commercialization. Cardiac safety testing was instituted as a regulatory requirement about a decade ago in response to adverse reactions, providing the goal alignment, standards, and funding to foster extensive specialization and collaboration. For example, ion channel screening services and equipment constitute large, vibrant markets that intersect with primary drug research initiatives. Electrophysiology, high-content screening, and other equipment is providing simultaneous analysis of both ion channel performance and cell physiology, in real time. The unique signature beat of each cardiomyocyte, monitored alone or in response to test substances, seems to epitomize the ideal of elegantly simple in vitro and in silico applications. Contrast that with liver, which is much more complex. However, developments from in vitro ADMET (absorption, dissolution, metabolism, excretion, toxicity) have evolved to enable measurement of genetic variation in drug metabolizing enzymes for study of drug-drug interactions and adverse drug reactions. And key innovations in cells, 3D systems, and in silico models abound. For example, a sizable sector of 15–20 companies has arisen around the development of primary liver cells as alternatives to immortalized tumor cell lines, and is now innovating in areas like cryopreservation techniques and controlled proliferation. Another dozen or so companies focusing on 3D cell culture systems are enabling study of cell signaling and other increasingly sophisticated systemic effects in vitro. Differentiation and production at-scale of liver stem cells (hepatocytes) continues to mature. And in silico models for drug-induced liver injury are using “virtual patients” that can be used to instantly simulate experiments that could take months or years to perform in living people, greatly reducing the need for animal studies. But the brightest hope may rest on the sometimes overlooked distinction of rigor. The in vitro field has extremely rigorous standards, requiring on average 10 years for validation of a single method robust enough to show relevance and reproducibility across international initiatives. Being able to judiciously leverage these proven scientific and quality assurance practices, like weight of evidence and basic tenets of good laboratory practices, could be important across a wide landscape of academic and medical research. In fact, while much of the publicity in the burgeoning field of biomarkers focuses on clinical applications such as companion diagnostics, the in vitro methods for preclinical testing are quite similar. So while technical and other challenges have served to limit sample sizes for biomarker studies, constraining their validation and greater adoption, it seems that help may be on the way. In addition to almost doubling the market to $10 billion by 2017, we expect to see increased diffusion of these so-called alternative methods and technologies across clinical applications like biomarkers and systems biology over the next 5–10 years. And mice will play! Robert G. Hunter (rhunter@wave-pt.com) is the author of “In Vitro Toxicity Testing: Technologies and Global Markets,” published in December 2013 by BCC Research. For more information see www.predict-medicine.com.